We provide several programs to be able to check your email online. The last of these is RoundCube. This takes you to the main interface screen for RoundCube where your Inbox will be displayed. On the left are your email folders, by default, RoundCube will always show your inbox when you login. 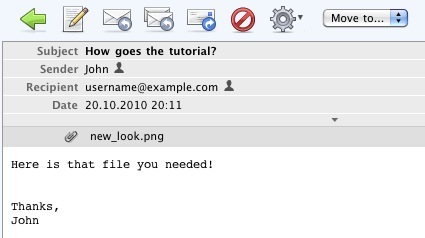 The toolbar box contains icons which let you manage your email. Here you may check for new mail, compose new messages, reply to a message, forward a message, change the read status, Print the message and view the source. Now, you can read the emails you've received. Click on the message's subject. Your message is displayed with the options to reply, delete, print and move the email. These icons let you create a new email message, reply to the sender, reply to all recipients or forward the email. These icons let you delete the email message, print it, or view its source code. You are also able to send a new email. To send a new email click the icon with the paper and pencil. You can send to multiple clients by separating email addresses with a comma. You may also add fields to send Carbon Copies, Blind Carbon Copies or Reply-To addresses. The email can be composed in Plain text or HTML. Once your email is composed properly, click 'Send now'. Your email has now been sent. Can I send an email with large files/attachments? How can I change the outgoing SMTP port from 25 to 26? Why can I not send/receive certain types of attachment?